Steve Harvey can’t count the number of impressive women he’s met over the years—the many incredible women who can run a business, have three kids, maintain a household in tiptop shape, and chair a church group all at the same time. So, when it comes to relationships, why can’t these same women figure out what makes men commit? According to Steve, it’s because they’re asking other women for advice when they should be going directly to the source. In this expanded edition, Steve includes an added section of all new advice, with tips on dealing with your partner’s exes, spicing up your relationship, ensuring you’re ready for that walk down the aisle, and much more. 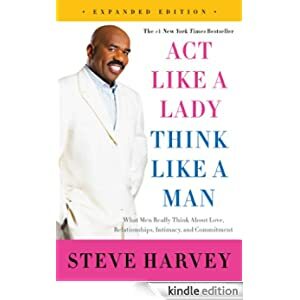 Sometimes funny, often unflinchingly direct, but always truthful, Act Like a Lady, Think Like a Man is a book you must read if you want to understand how men think when it comes to relationships, intimacy, and love. Buy this popular book today for $1.99.